NUSTEP Content Management Server provides intuitive user interface for content authoring and updating. Internal WYSIWYG editor works much like MS Word. The editor provides basic text formatting functions, work with tables, styles, management of images, attachments and references. Support for content importing from other office applications is a matter of course. 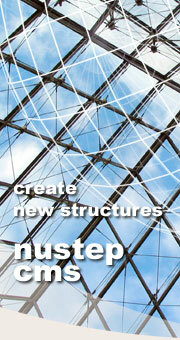 NUSTEP Content Management Server joins advantages of a database and a publication system. It enables to manage web content as content objects (articles, books, press releases, ...) instead of individual pages, images and documents. Is supports modeling of relations between these objects, thus allowing for implementing complete web applications. NUSTEP Content Management Server helps to increase the value of published content. It enables to schedule the publication of content. With accurately defined workflow it minimizes the number of inaccurate information and ensures that no information is published before its approval. NUSTEP Content Management Server provides functions for controlling multiple versions of content. Visitors of the website never see the draft version of content, they have only access to approved and published information. System enables to compare the versions, rollback to any previous version and it eliminates access conflicts between users while updating content. NUSTEP Content Management Server provides two types of roles for users: administrators and editors. Administrators have access to all system functions. They are responsible for template, user and workflow management. Editors create, approve, publish and update content without the knowledge of any programming or scripting language (e.g. HTML). System enables administrators to easily create and delete users, assign user rights and track user activity. NUSTEP Content Management Server follows the principle of separating content from design. Using templates it enables to centrally manage the website design and enforce consistency and corporate branding. The template system does not limit the design, structure or navigation of the website. Templates can be nested, thus allowing designers to create flexible information architecture for web pages. Only a few templates has to be updated to change design of the whole website. NUSTEP Content Management Server provides analytical tools that enable to track the behavior of site's visitors. It provides detailed information about usage of individual sections of the website and useful information for optimization of content, site structure and navigation. It shows the number of sessions, hits, users, qualified users, unique IP addresses, stickness, client information including browser type, platform and screen resolution, keywords used in search engines, most frequent entry and exit pages, clickstream analysis and other. NUSTEP Content Management Server provides native multilingual support. It enables to manage content in multiple languages. The structure of individual language localizations can be identical, separate or partially identical. The user interface is available in english and slovak. Other languages can be easily added. NUSTEP Content Management Server provides functions for content migration. It enables to export the content in standard format, import content from existing applications and supports content exchange between business partners. Content migration is based on XML technology that provides a standard platform for data sharing. NUSTEP Content Management Server provides modular and scalable web platform. Application can be extended with additional modules and scaled for performance.